(Saint Gabriel Archangel): “My beloved brethren, I, Archangel Gabriel, come today from Heaven to bless ye and give ye Peace. Peace! Peace! Peace! May Peace reign in your hearts. May Peace be your life. May Peace be your strength and may it be the light of your souls. Open your hearts to Peace; receive it. 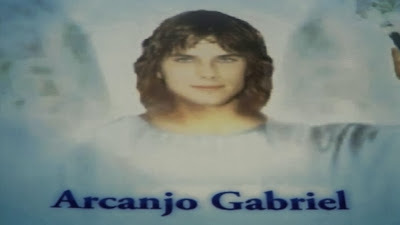 Heaven wants to give ye Peace in abundance Here in these Apparitions of Jacarei. So, open your hearts, wide, to receive this Peace. Renounce all sin, so that the Sacred Hearts give ye true Peace. You cannot receive the Peace of Jesus living according to your will. So, renounce it, in order that Peace enters in your heart and fills your whole being. In afflictions, in difficulties, in sufferings, despite fears that your human nature feels, do not allow Peace to be lost from your hearts. Come to Me in Prayer and I will comfort ye, I will help ye and give ye Peace. Have recourse to Me, because I love ye so much and want so much to help ye always. Peace is the greatest treasure that Heaven offers ye Here. Receive this treasure in your heart, love it, keep it, so he can enrich your lives always more and the whole world. This peace, which is the fruit of prayer and conversion, must now gush forth in your heart and radiate from your heart for the world. What human beings need most now is to have Peace, because without Peace, man cannot know God or serve Him, nor save himself. Therefore, live in Peace, pray to have Peace and pray for this Peace to increase in your heart. I, Archangel Gabriel, love ye very much, cover ye ever more with My Wings and pull away all evil from ye. In difficulties, call for Me, pray to Me and I will come immediately to comfort ye and give ye once again Peace.